We have individual class on demand and generally we come at your home or any other home you like. You can also buy Gift Tickets to give a nice present surprising someone you love! You can choose from our Teaching Recipes List the kind of recipe you would like to learn or to gift. But… we can combine business with pleasure! You may want to learn some recipes and do them for the same evening or better the day after to amaze your guests!!! 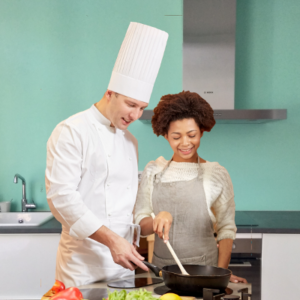 So… we teach you the recipes you want to learn and, in the same time, you are preparing the meal for your guests! We’ll also teach you how to serve the dishes you’ll have done and how to set up the table. We just need to know what is the purpose of your guests gathering and we’ll give you our suggested recipes for the event. Feel free to aks any details and estimation. Just fill the form in the bottom and we’ll answer you in 2 or 3 hours. You can also send an email to quellichevanno@gmail.com and we’ll answer a little bit earlier. We are really glad to share our passion with you! Do you want to know more about our courses? Even when someone of us comes alone, we need at least 3 people to justify the price so, think of it please. Generally we need at least 2 weeks to organize an event but, if you have a special urgent need, feel free to contact us, we’ll try our best! Just go down on this page and fill the form or write to our email quellichevanno@gmail.com (a little bit faster). We give an answer not more than 2 or 3 hours. We are generally working in Utrecht, Eindhoven and Delft but we can move in any part of Netherlands.